Well said, Jan. I was going to edit the entry to add my perspective, but you covered it all nicely. I would add that it was cool to see my friend Cliff on the route, he was there to cheer on his mom, and it was he who snapped most of the great shots that we have so far. Well done you!! So proud of both of you for all that you have done. Spoke with your mom the other day and she told me all the stories. Great job! Enjoy the high and the new job, Janis. Jordan, be safe in your travels and say hi to Alex and her family for us. Thank you very much, Auntie Christine! We were thinking we should have made YOU a TEAM BEHAN shirt, too! 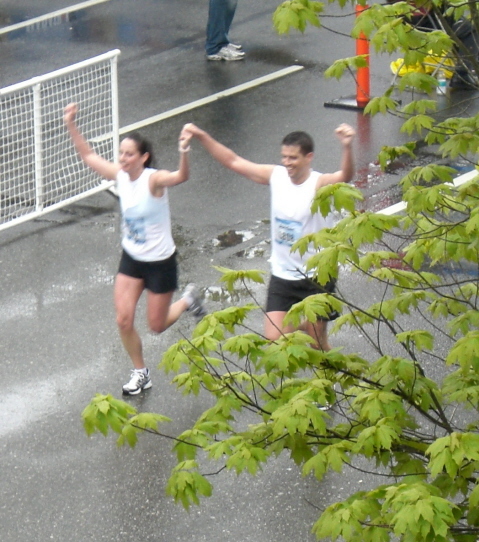 What you did was no small feat either, so congratulations are in order for completing the half. In case you missed it, we wished you well in a previous post. Sorry we missed you on race day, I would have loved to have cheered you on. Gave me goose-bumps…… congratulations Jan I am so thrilled you achieved this!